Two doors up from the former tattoo parlour, opposite the intersection of Underwood and Parramatta Roads, is this bookkeeping establishment. In rowdier days, it was clearly a motorcycle accessories and spares outlet. 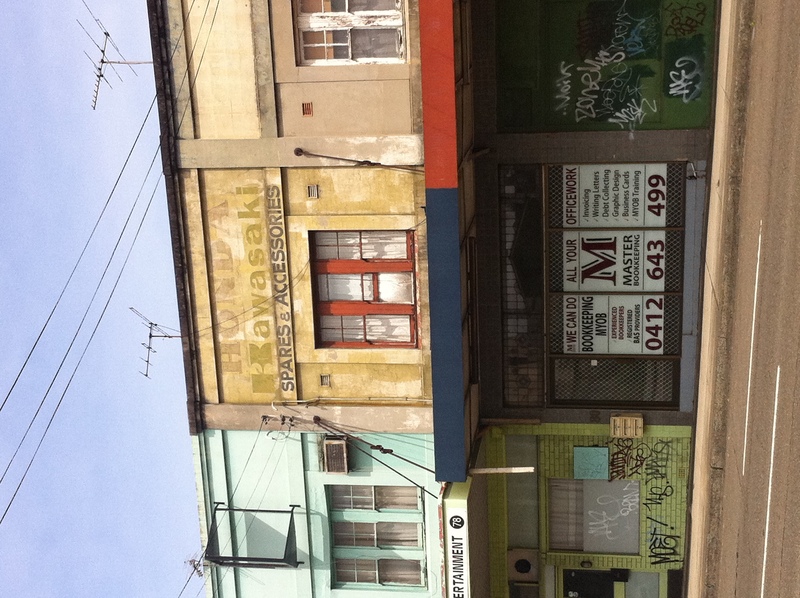 This not only strengthens my theory about the area being a bikie hotbed, but proves that whoever replaced the bikie-themed shops went way overboard in approving anti-bikie businesses for tenancy. Or did they? Bikies need bookkeeping too. What do you think the B in MYOB stands for? Signage, grafitti and painted adverts – writing writing everywhere ! I remember this bike shop well. It was quite a normal place run by a gent in grey King Gee’s. It pre-dates the Tattoo parlour and the influx of other bike shops. To the left was a pool hall and Victor’s Milk Bar that became Pizza Antica. Further to the left on the corner was John Webb’s “American Chopper Imports”. Directly over the road was Rick Powell’s “The Hog Stop” near the Swiming pool shop. Everything a biker needed. Custom Chopper parts, food, a game of pool, a swim, a tattoo and a beer at the Horse and Jockey which at that time had a resident rock band on sundays made up of members of the Cossacks motorcycle gang.